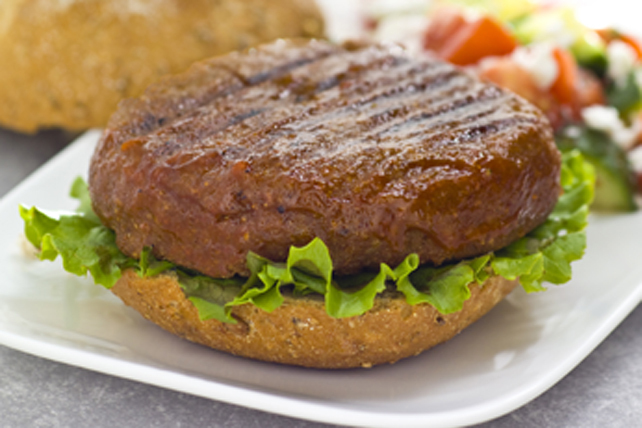 These oh-so-delicious meatless burgers are sure to be loved by vegetarians and meat lovers alike. Use pulsing action of food processor to process chickpeas and walnuts until finely chopped and well blended. Spoon into large bowl. Add next 6 ingredients to food processor; pulse until finely chopped. Add to chickpea mixture along with bread crumbs, egg and 2 Tbsp. barbecue sauce; mix well. Shape into 8 (1/2-inch-thick) patties. Heat large nonstick skillet sprayed with cooking spray on medium heat. Add half the patties; cook 5 to 7 min. on each side or until firm and evenly browned on both sides. Brush evenly with about 2 Tbsp. of the remaining barbecue sauce; turn. Cook 30 sec. ; turn. Brush evenly with about 2 Tbsp. of the remaining barbecue sauce. Remove from skillet. Repeat with remaining patties and barbecue sauce. Fill buns with lettuce and burgers. Top burgers with your favourite condiments. Serve with a side salad drizzled with your favourite Kraft or Renée's Vinaigrette. Decrease barbecue sauce to 6 Tbsp. Mix 2 Tbsp. barbecue sauce with chickpea mixture, shape into patties and cook as directed, omitting the final barbecue sauce glaze. Mix remaining 1/4 cup barbecue sauce with 1/2 cup Kraft Mayo Real Mayonnaise; spread onto cut sides of buns before filling with lettuce and burgers as directed. Omit the buns. Serve burgers over lettuce leaves.